Lipomas are the most common soft-tissue tumor. A lipoma is a lump of fatty tissue between skin and the underlying muscle. It feels rubbery, soft, lobulated masses enclosed by a thin, fibrous capsule and may be able to move it around a bit. A lipoma is usually painless, harmless, and not cancerous. Lipomas tend to grow slowly over months or even years. Although the rare lipoma may become as large as 8 inches, most stay smaller than 2 inches. A lipoma is the most common soft tissue tumor in adults, occurring in one in every 1,000 people. It can develop in people of any age, even in newborns, but it typically appears in adults between ages 40 and 60. Lipomas are slightly more common in men than women, and about 20 percent of people who have one lipoma develop another. Speculation exists regarding a potential link between trauma and subsequent lipoma formation. One theory suggests that trauma-related fat herniation through tissue planes creates so-called pseudolipomas. It has also been suggested that trauma-induced cytokine release triggers pre-adipocyte differentiation and maturation. To date, no definitive link between trauma and lipoma formation has been prospectively demonstrated. While the exact etiology of lipomas remains uncertain, an association with gene rearrangements of chromosome 12 has been established in cases of solitary lipomas, as has an abnormality in the HMGA2-LPP fusion gene. Complete surgical excision with the capsule is advocated to prevent local recurrence, whether the lipoma in question is subcutaneous or intracardiac in origin. 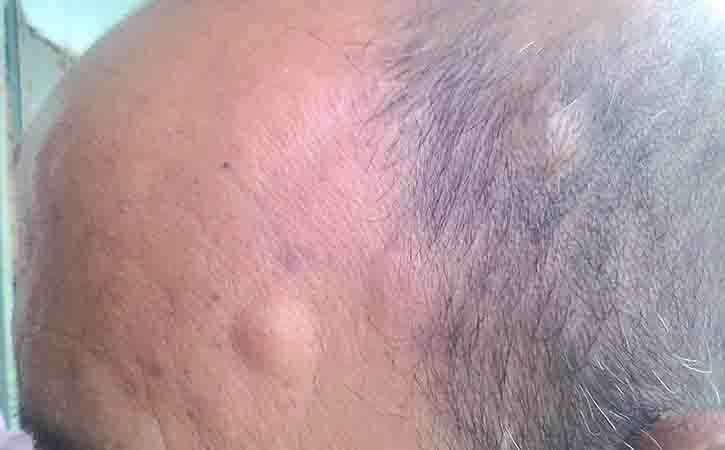 These lesions may be lobulated, and it is essential that all lobules be removed. Specific therapy depends on the location of the tumor. Subcutaneous lipomas are removed for cosmetic reasons, and hence, a cosmetically pleasing incision should be used. The incision is usually placed directly over the mass and is oriented to lie in a line of skin tension. Steroid injections also use to shrink the lipoma but not eliminate it. Liposuctin is an alternative that allows removal of the lipoma through a very small incision, the location of which may be remote from the actual tumor. Liposuction may be employed more often in small facial lipomas, because favorable aesthetic results have been obtained through strategically placed incisions. Liposuction is indicated for the treatment of medium-sized (4-10 cm) and large (>10 cm) lipomas; in small lipomas, no advantage has been reported, because these tumors can be extracted through small incisions.